Duette® Honeycomb Shades come in fire-retardant fabrics. A window without window treatments. With energy-efficient Duette® Honeycomb Shades. The red areas indicate heat loss at the window. Without energy-efficient window treatments, as much as 50% of a home's heating and cooling energy can be lost through its windows. Here at Belmar Window Shop, many of our window covering products are designed to reduce the amount of solar heat that passes through the window, which is known as the Solar Heat Gain Coefficient (SHGC). The lower the SHGC, the more protected your home is from the sun's heat. To enjoy the sun's warmth when desired, simply raise or open the window fashion and invite it in. To maximize energy savings at the window, we recommend Duette® honeycomb shades from Hunter Douglas. Hunter Douglas invented the highly energy-efficient Duette® honeycomb shades in 1985, in response to the energy crisis of the late 1970s. In 2006, Hunter Douglas created the Duette Architella® honeycomb fabric, which features a honeycomb-within-a-honeycomb design for even greater energy efficiency. Hunter Douglas' latest innovation is the Duette Architella® Trielle™ honeycomb fabric, which adds another layer, creating 5 insulating air pockets inside the shade. 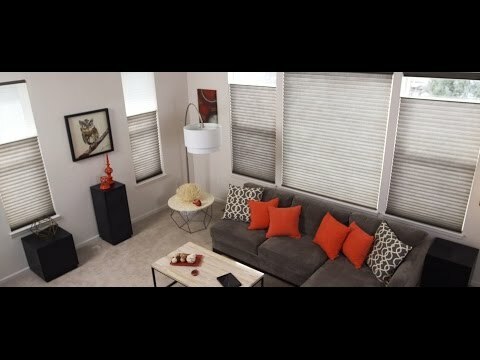 Learn more about Duette® honeycomb shades. The warmth provided by the sun, its solar energy, may be desirable during the winter to help heat your home, but in the summer, it can make a room overly hot and uncomfortable—driving up air conditioning costs. Many Hunter Douglas window treatments help to control solar heat by allowing it into your home in the winter and minimizing the amount that comes in during the summer. 1. Ensure your windows and doors are properly weather-stripped. 2. Caulk around basement and storm windows. 3. When heating or cooling, keep windows locked. 4. Open your window coverings during sunny winter days to catch free solar heat then close them at night to keep that heat in. 5. Close your window coverings during summer days to keep the heat out. Hunter Douglas is the industry leader in making a big energy savings difference at the window. Questions? We can help! Please contact us here at Belmar Window Shop.